Two days ago it began to snow. And went on snowing, thick, wet flakes swirling down hour after hour after hour. Driven by a strong, gusty wind the sticky snow was plastered onto rocks and trees and piled up into great drifts, rippled like sand. I ventured out into the blizzard and wandered through a hazy landscape, ethereal trees fading in and out of the pulsating air, the ground and sky merging out in the meadows, the world lacking solidity. The ground collapsed and broke at each step, the snow sucking my boots down, making lifting them hard work. Soon I turned and trudged home, my body labouring slowly through the resisting snow but my mind swooping free, exhilarated by the storm and the sharp touch of real winter. By dawn the next day the snow had stopped falling and the land was white and pristine. Out to the west the high mountains were hidden in dark rushing clouds but here in the foothills of Strathspey only thin shreds of cloud, ripped by the wind, swept overhead and the sun shone hazily through their ice crystals. I went out on skis, the first time straight from the house this winter, and slid through the soft snow, drier and more powdery than when it fell due to a hard overnight frost. The ease of skiing, of slipping effortlessly over the snow, contrasted with the laborious postholing of the day before. The woods were quiet and still, the meadows white seas of undulating snow, blown into gentle frozen waves by the wind. The big pines had developed split characters. Towards the north-west, from whence the snow had come, they were white and cold, to the south-east they were green and brown and warm, their bark glowing reddish-gold in the sun. Tracks of rabbits, pheasants and roe deer radiated out into the meadows from the woods, heading for clumps of reeds and tall grass only partly covered by the snow. The thin prints of the pheasants ran across the surface of the snow, the deer and rabbits went in deep, showing what a struggle they had reaching essential if meagre food. A buzzard called overhead, drifting across the sky with barely a wing beat. A flock of chaffinches fluttered, calling shrilly, across the open space between two pines. Startled by my sudden fast approach a pheasant shot, squawking loudly, into the air and crashed off through the bushes. Mostly though the land was still and quiet, nothing moving, nothing making a sound, just the quiet hiss of my skis across the snow and the rustle of the wind in the tree tops. I slid down a bank into the mouth of a steep narrow ravine filled with a tangle of old trees, a hidden, secretive spot that is one my favourite local places. There is a sense here of the old wildwood, of an ancient forest untouched and undisturbed by humanity or civilisation. I looked in from the edge, up the little stream trickling through the dense woods, then turned away, there being no place for skis in the undergrowth, and skied home across wide, open meadows with the high Cairngorms finally appearing out of the clouds. 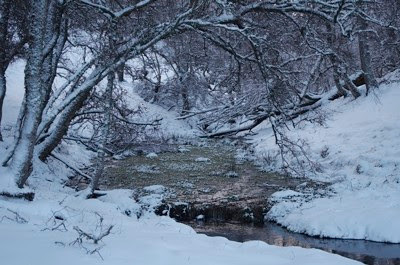 The image shows the little ravine the day after the snow came. Photo info: Canon EOS 300D, Canon EF-S 18-55 mm IS @ 43mm, f5.6@1/100, ISO 100, raw file converted to JPEG in Capture One Pro.